Higher interest rates are going to impact many in the U.S. One such victim that shouldn’t be overlooked is automakers. Long-term readers of Lombardi Letter have been warned about it over and over again. There were some sectors that got a boost from historically low interest rates, but as rates go higher, we could see them struggle. You see, automakers had a great time during low interest rate period. Why? Because lenders were willing to lend to everyone. 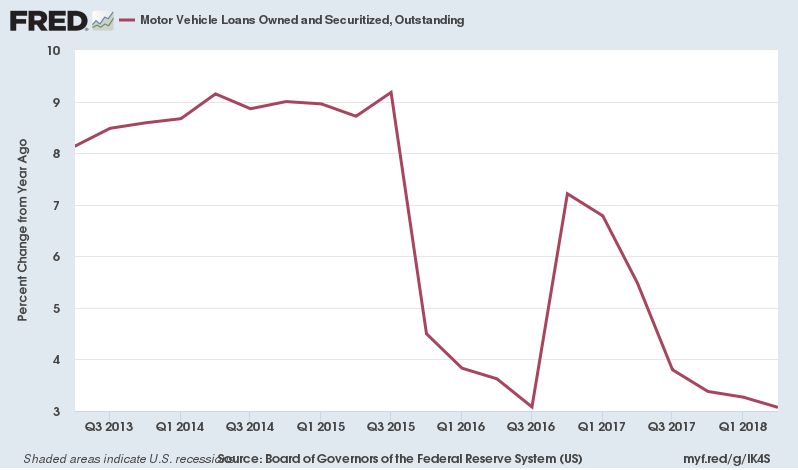 Source: “Motor Vehicle Loans Owned and Securitized, Outstanding,” Federal Reserve Bank of St. Louis, last accessed October 25, 2018. In 2010, the amount of auto loans outstanding was around $700.0 billion. In the second quarter of 2018, that total stood at $1.12 trillion. That’s an increase of over 60% in about eight years. And here’s the thing: more car loans equals more car sales. Now the big question: will lenders seen as many loans as interest rates go up? Before going into any details, consider this: a lot of the auto loans were made to subprime borrowers—those with low credit scores. In the wake of higher rates, lenders would certainly want to make more loans, but will potential borrowers be able to do so? Will they qualify to get an auto loan to buy a car? 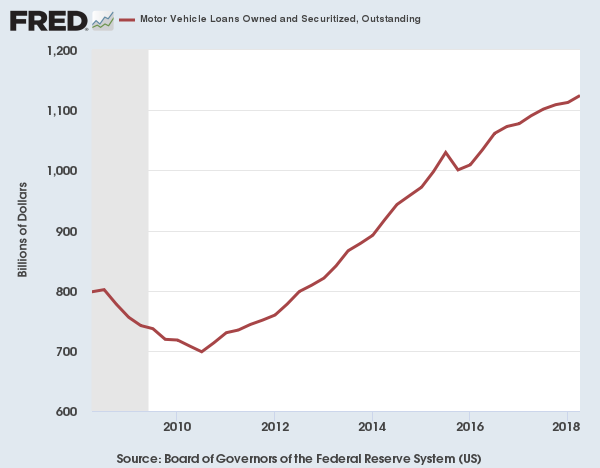 Source: ““Motor Vehicle Loans Owned and Securitized, Outstanding,” Federal Reserve Bank of St. Louis, last accessed October 25, 2018. The Federal Reserve started to raise interest rates in the fourth quarter of 2015. Since then, we have seen the auto loan growth rate tumble. The big thing going for automakers since the financial crisis was low interest rates. There were more loans, and that led to higher auto sales. It’s very hard to think that as auto loans growth is slowing and interest rates are going higher, car makers will sell more cars and make money. Automakers could be facing a lot of scrutiny ahead of this. And, we could be seeing their stock prices tumbling. Now, investors are starting to realize this, and they are panicking. Look at the chart below for example. It plots the Dow Jones U.S. 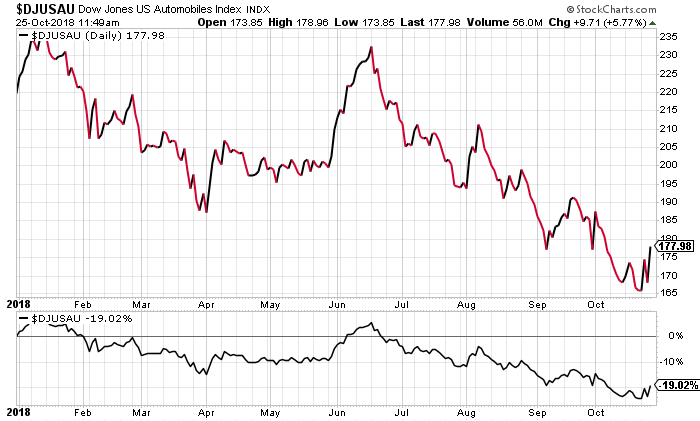 Automobiles Index. Essentially, this index tracks the performance of automaker stocks. Year-to-date, automaker stocks have dropped 19%. If you look at individual automakers, the returns are much worse. For example, Ford Motor Company (NYSE:F) has plummeted about 25% year-to-date. I think the worst is yet to come. When the data starts to show lower car sales, that’s when even the long-term holders of these companies will question their investment. But obviously, only time will tell.